Charles McAlinden was born on the 31st of October 1932. By 1956 he had become Irish half-mile champion; and in 1959 appeared in the Scottish Athletics Yearbook with one mile in 4.20.3. His club was Babcock & Wilcox, Paisley. For the earlier part of his running career, Charlie concentrated on shorter track races, and avoided running three and six mile events. However he was encouraged by Harry Fenion, the 1957 Scottish Marathon Champion, to try the 26 mile classic distance. In both 1964 and 1965 Charlie finished third in the Scottish Marathon, improving from 2.39.22 to 2.25.45 when finishing a meritorious fifth in the AAA Marathon at Port Talbot, when Bill Adcocks was the winner, followed by Brian Kilby, Juan Taylor and Alastair Wood. Consequently, when he lined up for the 1966 Scottish Marathon, Charlie McAlinden had hopes of running fast enough to be selected by Ireland to compete in that year’s European Championships. Certainly he was a much-improved athlete and, on form, was capable of a very good run. However it would not be easy. The course was an undulating out and back route: from Westerlands in Glasgow, out to Vale of Leven and back. The weather was sunny and hot. Gordon Eadie of Cambuslang, the 1960 winner, was also competing, along with his clubmate Andy Fleming. Newcomers included Donald Ritchie (Aberdeen AAC) who was attempting his second marathon and only beginning his illustrious distance running career (especially as a world-class exponent of ultra-marathon racing). Another novice that day was Jack MacLean (Bellahouston Harriers), who took part in sixteen Scottish Marathon Championships in succession, starting with this one! After a few miles, the leaders began to stretch the field as they maintained a good pace. Hugh Mitchell (Shettleston) had been told before the race that sub 2.25 would be considered for the Scottish team in the 1966 Jamaica Commonwealth Games Marathon, so he moved ahead, accompanied by Charlie McAlinden. 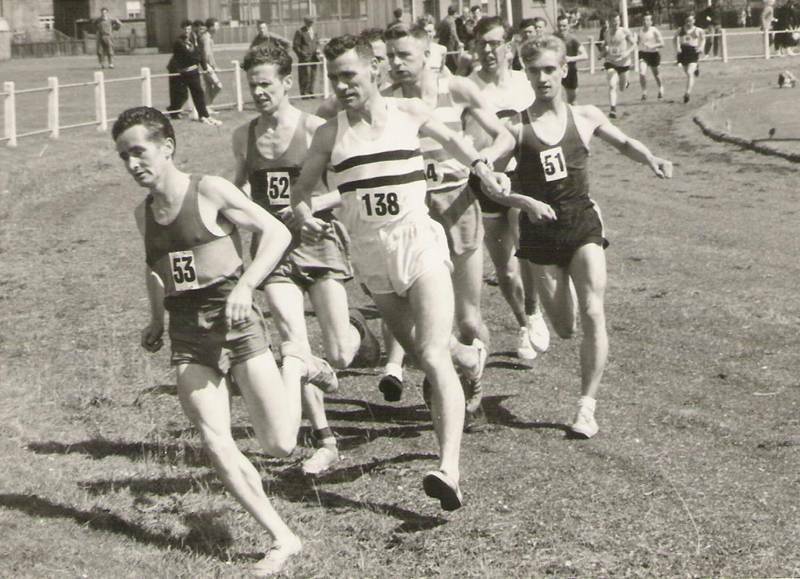 Further back, Gordon Eadie was running in a group containing Donald Ritchie. There was little change in the positions as Singers Industrial Estate, the half-way point, was reached. The runners completed a circuit of the grounds before returning to the roads. After keeping up 2.23 pace to twenty miles, Hugh Mitchell had to drop back, leaving Charlie on his own and feeling ‘hunted’. An extra problem he had to deal with was that he did not drink at all on this especially hot day. His friend Tony McManus was meant to hand him a special drink at twenty miles, but the officials of that era followed very strict rules about water stations, and Charlie had to carry on without refreshment. At 24 miles, Hugh Mitchell dropped out. Gordon made an effort to close the gap on the leader and chased hard through 20 and 23 miles. He moved into second behind Charlie McAlinden. However the strain of racing fast in hot conditions was forcing some runners to give up, and even the leaders were slowing down. Gordon could not manage to take the lead from a struggling Charlie, who found some strength in the last two miles to move away and win the battle in 2.26.31. Gordon Eadie finished in 2.28.19 and Andy Fleming, his Cambuslang clubmate and advisor, came third in 2.32.47. The 1966 European Marathon in Budapest was indeed won by an Irish athlete – Jim Hogan, running for Britain! Although the Irish selectors sent home-based athletes to the European Championships, and ignored Glasgow-domiciled Charlie McAlinden, he did not give up. After he turned 40 years of age and became a veteran, he had a great deal of success, racing for Paisley Harriers and winning Scottish titles at 5000m, 10,000m, ten miles and marathon. In addition, although in the 1973 Scottish Veterans Cross-Country Championship he finished second, behind the great Bill Stoddart, Charlie went on to win that prestigious title three years in succession (1974-1976). In 1974 the World Veterans Marathon Championship was held on the outskirts of Paris near Versailles, on a very awkward course, involving a network of cross-country paths. The clear winner (and first home for the Scottish team) was Alastair Wood (Aberdeen AAC), who reckoned that he did well to record 2.28.40. When a vehicle carrying the film crew got too close to the irritable leader, Alastair remembered that he waved vigorously and yelled, “Allez! Allez!” to make them retreat to a reasonable distance! Wood was supported by his Scottish team-mates: Charlie McAlinden, who must have been pleased to finish well up in ninth position; and another Aberdeen runner, Charlie Greenlees. The Scottish team finished first and won World Veteran Championship gold medals. Charlie McAlinden returned to the Scottish marathon rankings in 1980 (2.32.25), 1981 (2.33.59) and, at nearly fifty years of age, in 1982 (2.34.15). Nowadays, these would still be considered very impressive Masters times. After retirement, Charlie retired to Aviemore, and enjoyed hillwalking.